Since October 1962, the open and flagrant violation of constitutional guarantees in Mississippi has precipitated serious conflict which, on several occasions, has reached the point of crisis. The United States Commission on Civil Rights has become increasingly alarmed at this defiance of the Constitution. Each week brings fresh evidence of the danger of a complete breakdown of law and order. Citizens of the United States have been shot, set upon by vicious dogs, beaten and otherwise terrorized because they sought to vote. Since October, students have been fired upon, ministers have been assaulted and the home of the Vice Chairman of the State Advisory Committee to this Commission has been bombed. Another member and his wife were jailed on trumped up charges after their home had been defiled. Even children, at the brink of starvation, have been deprived of assistance by the callous and discriminatory acts of Mississippi officials administering Federal funds. All this affronts the conscience of the Nation. 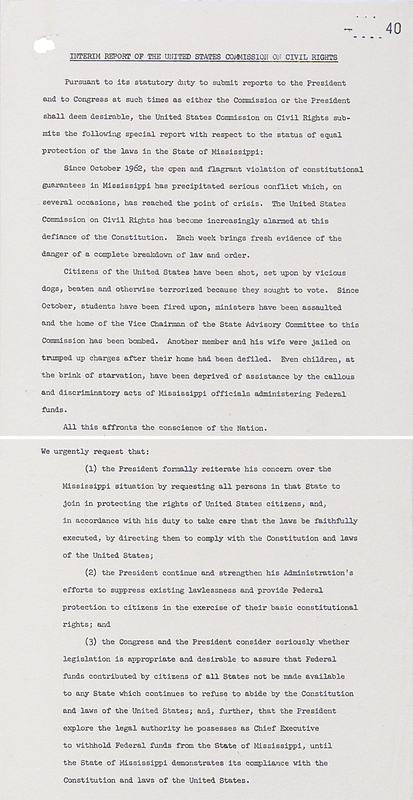 (3) the Congress and the President consider seriously whether legislation is appropriate and desirable to assure that Federal funds contributed by citizens of all States not be made available to any State which continues to refuse to abide by the Constitution and laws of the United States; and, further, that the President explore the legal authority he possesses as Chief Executive to withhold Federal funds from the State of Mississippi, until the State of Mississippi demonstrates its compliance with the Constitution and laws of the United States.